"You are one of the very few scholars who has gone deep into both Siddhanta and Hora and can speak with authority on both." Gayatri Devi Vasudeva, editor Modern Astrology. Initiated Brahmana (Vedic priest), disciple of A.C. Bhaktivedanta Swami Srila Prabhupada since 1976. 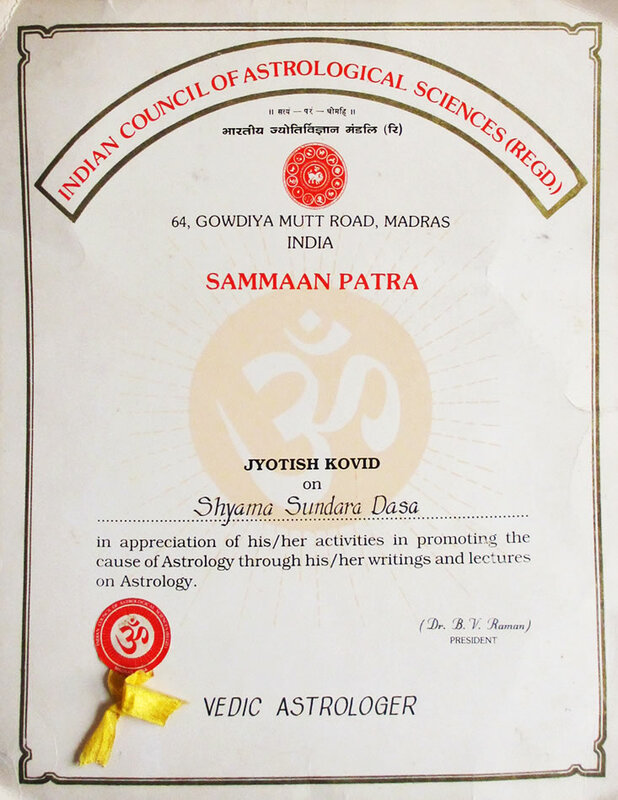 Student of Vedic Astrology since 1977. Given scholarships by the Bhaktivedanta Institute and Bhaktivedanta Book Trust to study Vedic Astrology in India. An authority in all the main branches of Vedic Astrology: Ganita (mathematical calculations), Jataka (Natal), Prashna, Muhurta and Nimitta. The late Harihara Majumdara of Kolkata, with whom he did his undergraduate study (1980-81) in Jataka with emphasis on East Indian tradition. The late B.G. Sashikanta Jain of Bangalore, with whom he did postgraduate studies (1981 -1983) in Prashna (Bhrgu style), Jataka and Muhurta. 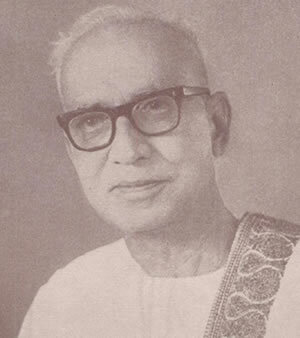 The late Krishnan Potti of Tiruvananthapuram, with whom he did postgraduate studies (1981 -1983) in Prashna (Prashna Marga style of Kerala). And, Iranganti Rangacharya of Hyderabad, with whom he studied the Jaimini system (2007). 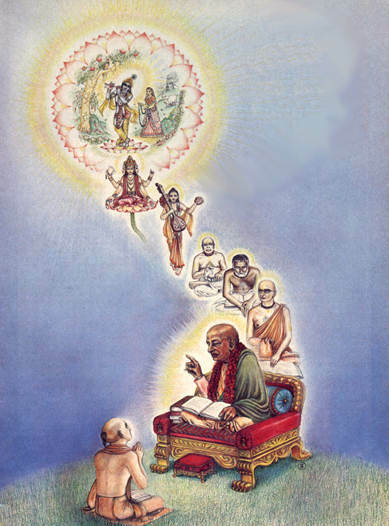 Shyamasundara Dasa is also a scholar of the Vedic Calendar and Mathematical Astrology (Ganita) in general. The computer program he wrote for calculating the Vedic Calendar is used in hundreds of ashrams worldwide and is freely availble for download and use. Use it to calculate your own local Vedic Calendar. Shyamasundara Dasa with S.M. Krishna April 24, 2008. At this time he predicted that S.M. Krsna would get a big promotion when his next period started.One year later he was made the Minister for External affairs in the Indian government. He began developing Vedic Astrology software in 1979. 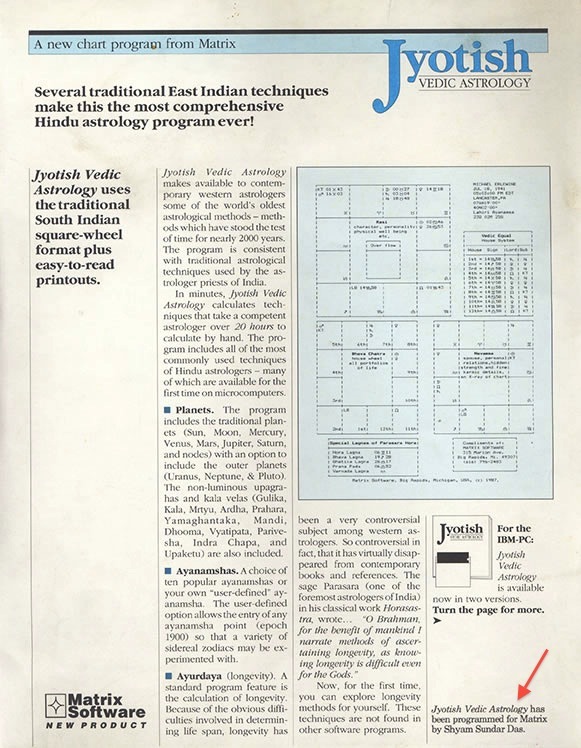 This culminated in a joint venture, in 1988, with Matrix software and the publishing of a professional level program called Jyotish Vedic Astrology. 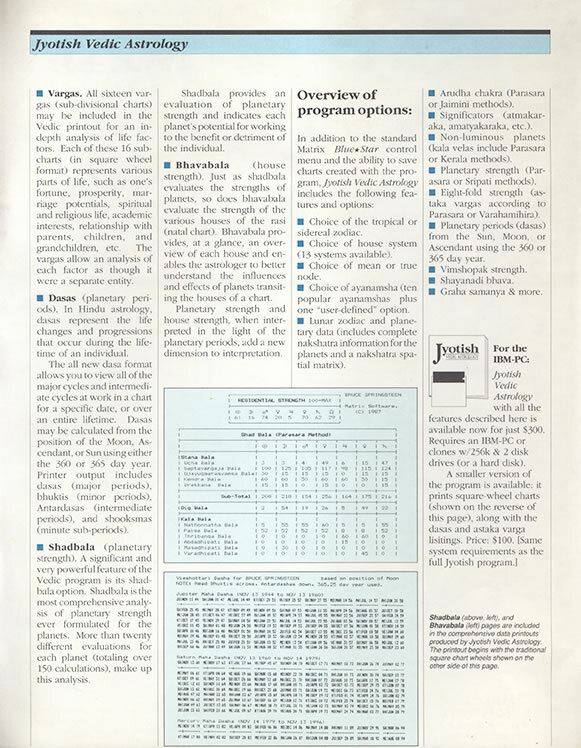 The following links show images of the front and back of the original announcement of the software release. He was requested by Dr. BV Raman (October, 1992) to become a founding member of the American Council for Vedic Astrology (ACVA). He declined. 1992 awarded Jyotish Kovid by ICAS. In 2012 he was awarded the degree of Jyotish Cudamani (Crest Jewel of Astrology) equivalent to a PhD by the Raman & Rajesvari Research Foundation of Bangalore. 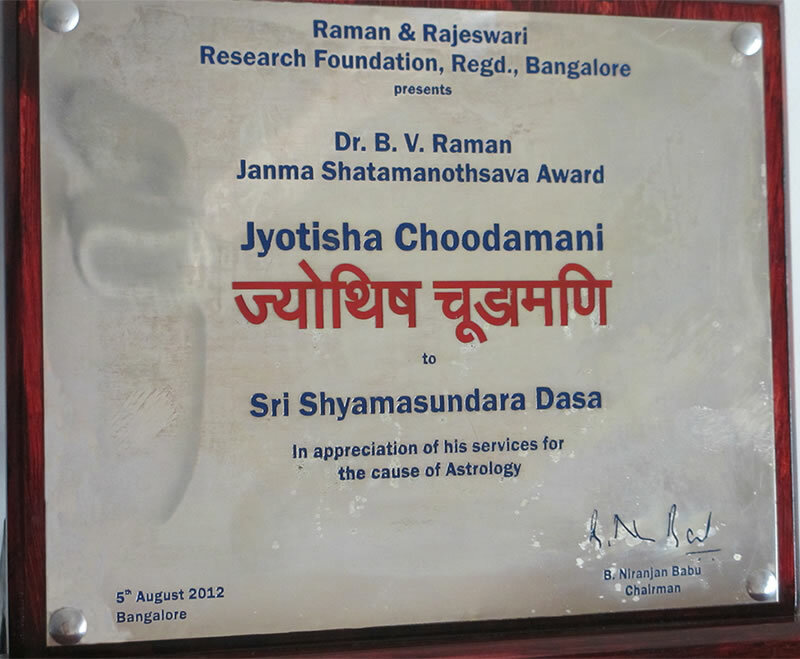 This is a formal recognition of his position as a Jyotish Acarya. He has authored numerous articles on Vedic astrology and Philosophy. He maintains a private online "Symposium" for Vedic Astrology since 1993. He has large astrological practice of satisfied international clients. Presenting a copy of Bhagavad-gita As It Is to former Prime Minister of India, Deve Gowda, before doing a reading of his horoscope, October, 2010. Patron member--Indian Council of Astrological Sciences (ICAS) since 1984. While we do offer services on this site it is primarily educational. Any money that we make from our services go toward continued study and publishing of well-researched articles that set a high standard in the jyotish community. As a brahmana my primary vocation is to study and share my knowledge with others. In traditional Vedic culture the general public and especially those who benefit directly from that knowledge help to support the teacher so that he can spend more time in deep study and continue the cycle. If your knowledge has been expanded and you are inspired by the Lord in your heart please donate an amount that you are comfortable giving. 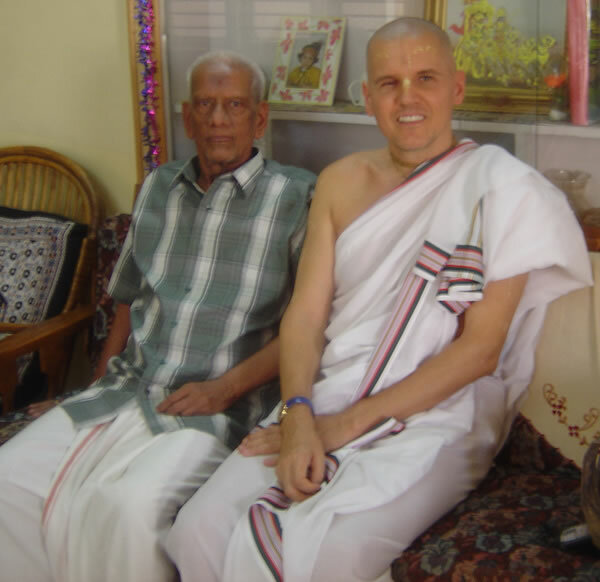 Sriman Iranganti Rangacarya and Shyamasundara Dasa, May 2007.